Two men standing next to a Reo truck in 1922. Forest City, Iowa, home of Winnebago Industries — well-known for bringing modern camping innovations to Iowa in the 1950s. But long before anyone had heard of Winnebago campers, a man in another Iowa community was gaining recognition for his design of a “camping car” — or “land yacht” as some called it. 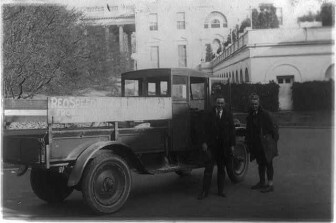 Dr. Mark A. Newland from Center Point had designed and built his camping car in 1921. Originally he had planned to have a local “carriage builder” construct the vehicle from his designs. He took the pencil sketches to a local man. When he got the estimate he couldn’t believe his eyes— $400! And that was just for the body—without interior finishes! “Outrageous!” Dr. Newland thought. So he took his design home and decided to build the camping car himself. Dr. Newland formed an oak frame with 13 feet long 2 by 4s and attached it to his *Reo truck chassis with 6 feet, 4 inch-long, 2 by 2 crossbars. The upright posts measured 1 ½ by 1 ¾, by 5’ 10”. He glued and bolted every joint to make it sturdy, used sheet metal for the sides and installed large screened windows. Inside he used burlap covered with a coat of battleship gray paint. To make the roof water tight, he painted it with “heavy white lead paint.” While the paint was soft, he spread a piece of “oiled rubberized cloth—similar to that used in army slickers”—over it. The interior cabinets were constructed of ½-inch poplar lumber. Upper sleeping berths accommodated two to four people. The folding table seated eight diners in “comfortable” chairs. The doors were fitted with sturdy locks. And there was a “mirrored gun cabinet” included. Dr. Newland claimed his “vacation machine” weighed just slightly more than the 5-passenger truck body that had originally sat on the chassis. And best of all, he had spent only $250 on his land yacht! Dr. Newland may have been the only camp car designer in the state of Iowa in 1921, but there were like-minded men in other states. G. Carl Adams of Garden City, NY, built a car that could sleep six. His “motor bungalow” carried its own water tank, refrigerator, pantry, and clothes closet. And in Sacramento, CA, cattleman F.W. Ehrhardt built his “Road Lizard” on an Oldsmobile chassis. It featured screened windows of “beveled plate glass” and a shower/bath attachment. The cost of the “Road Lizard” was $4,000. Ehrhardt said he had been using a version of the camping car for years — the original pulled by horses on his ranch. “I am here to be locked up,” E.P. Hessenius proclaimed as he walked into the warden’s office at the Iowa State Penitentiary at Fort Madison in October 1914.